How to really make an entrance, on cue, whether you're an emperor, a priestess or a salesman. Puccini loved to introduce his heroines offstage, defining their personalities through their voices before we see them. 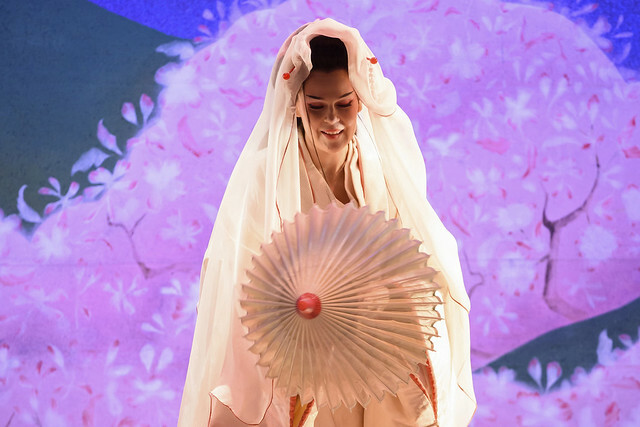 Here, at the arrival of Madama Butterfly, her pure soprano soars above an exquisite accompaniment for strings and female chorus as she makes her way to her wedding, praising nature and describing herself as the happiest girl in Japan – or even the whole world. The heroic general Otello makes one of the most exultant and commanding entrances in all opera, as he bids his people rejoice at his great naval victory over the Turks. Otello’s calm confidence, and his people’s ecstatic response, makes his later collapse all the more devastating. In Bellini's opera, Norma’s people hail her as she arrives to lead a religious ceremony. The majestic nature of the music – a stately march ending in solemn brass chords – highlights Norma’s powerful position in her society. This extract precedes one of opera’s most famous arias, Norma’s ‘Casta diva’. In Donizetti's L'elisir d'amore, ‘Doctor’ Dulcamara rolls into town in his rumbling old van, convinced that he can make a killing from the gullible villagers. He’s not wrong – his enthusiastic sales patter has the villagers queueing up in droves to buy his wares. The Royal Opera gives Emperor Altoum one of the most spectacular of operatic entrances when he judges the riddles in Act II of Turandot: he descends from the sky in a golden throne. The music accompanying Altoum’s arrival is based on a genuine Chinese march, which Puccini took from a Chinese musical box. These entrances feature in our livestream celebrating #OperaPassion Day, in partnership with the V&A and the BBC. Catch up with the stream on Facebook. Wagner’s Walkures isn’t here?? But whyyyyyyy?